I poke you with a feeble old lady! I poke you with my ps4 controller ! I poke you with my mapple syrup !! Counter poke with big greasy HAMBURGERS!! I poke you with the spell "Magic Missiles." I poke with an octopus! 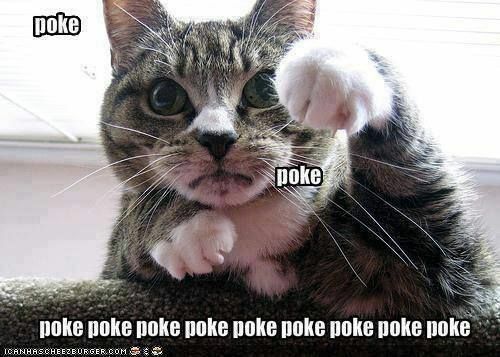 I poke you with a wrapped Xmas Gift! I poke you with a Porg. I poke you with a lightsaber! I poke you with my ale! I greatly poke you with the Tiger!